In the 2008 election cycle, America proceeded to elect her first black president. Predictably, blacks euphorically voted for Barack Obama in hopes of seeing what many considered a dream, become reality. The historicity and symbolism of that election were things that most blacks wanted to participate in, evidenced by ninety-six percent of blacks casting their votes in favor of Obama. The significance of his election on the psyche of black America couldn’t be minimized nor ignored. Many anticipated that the implications of such an historical event would be- and could be- channeled by millions of individual black Americans for their socio-economic benefit. Four years later, with most of his self-created and externally-projected veneer having worn off, Barack Obama won his re-election bid to the presidency. Even considering his poor economic stewardship and socially-divisive record, particularly the constant level of high unemployment and its impact on black America, exit polls showed that ninety-three percent of blacks voted for Obama anyway. That blacks voted for Obama in 2008 was understandable; in 2012 it was inexcusable, an example of irrationality. Because the economic situation for black Americans under the country’s first black president has been nothing short of atrocious. Since January 2009, the first month of Obama’s first term in office, the black unemployment rate was 12.7%. It wasn’t until December’s 2013 unemployment numbers were released that we saw black unemployment fall below twelve percent. The black unemployment rate was been at or above 13%, fifty-five times; at or above 14%, thirty-nine times; at or above 15%, twenty-nine times and at or above 16%, eleven times. Black unemployment hit its peak under Obama at 16.9% in March, 2010. Black teen unemployment has been worse- much worse. It’s been below thirty-five percent only twice during Obama’s reign- August, 2009 and February 2012. It’s been at or above 40%, thirty times. Black teen unemployment hit a high of 49% in September, 2010. 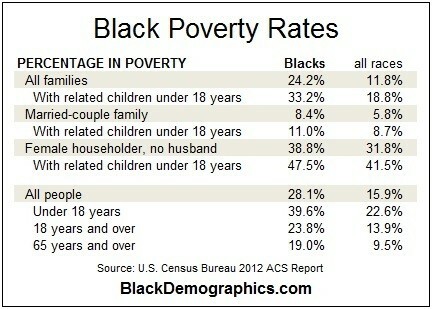 This is a catastrophic look into the socio-economic future of black America. And no one says “boo” about it. Last month, the overall unemployment rate for blacks and black teens was 11.9% and 35.5%, respectively. As we know, the drop in the unemployment rate among blacks isn’t the result of a growing and expanding economy but because, like the national unemployment rate, blacks are leaving the workforce as hope of finding work continues to fade. According to the Center for Economic and Policy Research, December 2013 saw the overall black labor participation dip .3% to 60.2%. This reflected the lowest rate in thirty-seven years (December, 1977). For black men specifically, the rate fell .7% to 65.6%, which is the lowest record to date. Sentier Research reported that between June 2009 and June 2012, median annual household income for blacks fell 11.1 percent to $32,498 (from $36,567). The drop for whites was 5.2 percent; for Hispanics, it dropped 4.1 percent. The Census Bureau reports (2010), via CNN Money, whites ($110,729) had twenty-two times more wealth than their black counterparts ($4,995). Also, according to the same report, of all the homes that report receiving food stamps, 26.4 percent are black; yet blacks are only 13 percent of the total population. For the record, forty-seven million Americans representing twenty-three million households now receive assistance through SNAP (Supplemental Nutrition Assistance Program). And this year, black homeownership has hit an eighteen-year low. With these kinds of stats, it’s no surprise that the black poverty rate now stands at twenty-eight percent, compared to just ten percent for whites. And yet, the Congressional Black Caucus is still not marching around the White House. Actually, they’re not doing much of anything noteworthy. This bleak economic picture and outlook is sad and at one point in time would’ve stimulated a quantifiable amount of sympathy for- or toward- blacks. But, not anymore because it’s very difficult to inspire sympathy when blacks intentionally contribute to that which ails them. It’s awful but it’s also inexcusable. Blacks that voted for Obama did so at the expense of their own best interests, period. Again, voting for Obama in 2008 was understandable- disagreeable, but understandable. The sad reality is that Obama got exactly what he needed from blacks- electoral support and continued racial defenses of his increasing number of inadequacies, mistakes and lies. Blacks are also getting exactly what they voted for in Barack Obama- a black mascot, and nothing more. Barack Obama is a false god, a symbol of a projected but poor representation of black power who has turned out to be power-less, not only for black America, but America as a whole, openly ridiculed both here and abroad. Continued support of Barack Obama by blacks demonstrates to the country that blacks still prioritize and commodify race at the expense of all else that’s important. If worshipping at the altar of racial pride and solidarity is what blacks want, choose and continue to do, they are responsible participants of their own reality while sacrificing their future. Blacks also severely undermine the future of their children, resigning them to a life of substandard living, government dependency or both. These are painful truths, but blacks must face them nonetheless. Is “race” still that important? 11/04/2008 was NOT about history having been made. If it were, the honorable Alan Keyes would have been seeking re-election. As much as you or I may not like the outcome, it was about history. Alan Keyes though a good debater with respectable intellectual prowess, wasn’t a serious contender for president. he was unelectable in the general electorate. No widespread appeal. At all. None. Zero. He had even less appeal among blacks. Additionally, it’s why when professional Democrats (politicians, MSM, academia, etc.) read the tea leaves and saw Obama/Choom’s candidacy was gaining momentum (which indeed was a shock considering his considerable lack of qualifications), they dropped support for Hillary and supported Choom. They wanted to be a part of history- to say they supported and voted for the country’s first black president. Race trumped gender in ’08 and was more historical appeal. That said, history would have been made had Colin Powell ran in 2000. But he didn’t and the way he’s turned out, it’s good he didn’t (although one can argue, persuasively in fact, he may not have become who he is now had he ran and won). The 2008 Presidential Election couldn’t have been simply about the president’s ethnicity. Alan Keyes was on the ballot twice prior. Absolutely correct. No white man or woman, with Choom’s qualifications- or lack thereof- would have been taken seriously as a presidential candidate, let alone be his party’s nomination. He got where he is as President, US Senator and state Senator of Chicago, into Harvard and the HL Review, solely on his race. It’s an example of affirmative action from beginning to end. And that’s the point. Alan Keyes, Jesse Jackson, Al Sharpton, Carol Moesley Braun, Herman Cain (despite Cain’s likeability, he had NO chance. NO clue about foreign policy and had difficulty explaining with clarity, his 9-9-9 tax plan) all ran for president. But none of them led their party’s ticket in the general election. None of them were considered serious contenders or candidates for the executive office. Choom as we see lacked preparation, common sense, experience and wisdom for the presidency. But it didn’t matter to those who voted for him twice and who continue to support embarrassing ineptitude even after the fact. That black skin has afforded him cover and shield from taking responsibility for his economic failures, foreign policy disasters (Egypt and the so-called Arab Spring, Syria, Libya, Iran; straining our relationship with Israel), IRS scandal, Benghazi, Fast and Furious, NSA tapping, numerous golfing expeditions, etc. And none of this even considers his associations with Bill Ayers, Jeremiah Wright, Khalid Al-Masour, etc., etc. I got you – so it’s just about race – cuz the man is certainly unqualified to be leading that which was once the greatest nation on the face of the planet. I see where you are coming from. Thanks for your replies. Were you able to read my blog? Yep. Sure did. And you’re spot-on about needing a leader with brass testicles and honesty. In our time, it’s Allen West- and I think it’s for that reason he was district-ed out of Congress. Way too straight forward, no BS, kind of leader for the checkpant, blue-blood GOP. He’s what the country needs right now and sadly, I don’t think we’ll ever experience his leadership in the executive office.